A short update before I return to the Kenyan bush and comunication silence. My meeting with Civet farmers and exporters in Ethiopia was ground-breaking. We had a very productive conversation and co-created a basic plan of action to establish the world’s first model Civet farm that can provide an “Ethical” source for Ethiopian Civet paste and products to the West. Though only the first of many conversations to come, both sides have their roles to play in the next year to make this happen for the benefit of the farmers, Civets, and the economy of this developing country. We, in the West, now have the opportunity to be actively engaged in solving the problems and not just turn our backs on them with an ineffectual and counter productive boycott as we have for the past 40-50 years. If you are concerned about ethics in perfumery this may be an opportunity to get involved. The second major landmark of my stay in Addis Ababa was meeting with my Somali Frankincense co-op manager who shares my own vision of fair trade and sustainability. Working directly with the western market, bypassing middlemen and benefitting the harvester communities with tools, training, education and medical facilities, he has signed yearly renewable contracts with the elders of 5 communities to work in mutual transparently for the benefit of the community and has committed to sell their resins to us. (Another opportunity to get involved in a worthwhile project). He has initiated a replanting program in the wild to maintain ecological sustainability and is working on a long-term replanting and sapling maintenance program with the harvesters. This co-op will provide Boswellia Carterii, the higher grades of B. Frereana, (which we rarly see in the West), Myrrh and Opoponax. At the moment we are discussing possible markets in the West and logistics of shipping. Professor Dagne may make his expertise and facilities in Ethiopia available for distillation of essential oils from their resins. I will keep you posted. If anyone has an interest in large amounts of these resins please contact me. For regular retail quantities, keep an eye on my shop. As some of you know, the purpose of my visit to Kenya is to help the resin harvesting women of the Samburu tribe gain greater beneifit for themselves, their families and communities via a fair trade platform and co-op. Originally planned as a 3 day visit to Samburu County, my host Andre of Indiginous Collective has graciously facilitated my request to stay an extra week in the field to make the most of our work with the Samburu. We returned yesterday evening from 4 days in the bush so I could catch up on correspondence and other obligations. We drive back up Tuesday or Wednesday to speak with more women about the co-op and purchase their resins. Nightly campsite visitors-Death Stalker Scorpion under UV light. A short description of the last 4 days would be abbreviated as- gorgeous cool mornings and evenings, sun stroke days, pristine semi-arid plains, sand, magnificent mountains, adorable wart hogs, ostriches, elephants, a thousand exotic birds, hordes of baboons, a ridiculously vast night sky blazing with stars, death stalker scorpions who phosphoresce under a UV light, lions, leopards, dry river beds with Ebony driftwood and not the tiniest shred of plastic refuse, water shyly hiding under the ground and in the desert air, herds of sheep, goats and camels, beaded women, pretty Moran warriors, biting mosquitoes, big hairy spiders, and hundreds of square kilometers of mixed Myrrh and Frankincense trees growing naturally as if planted intentionally. As far as the eye can see!! Commiphora, Boswellia and Acacia as far as the eye can see. The Samburu have not had the exposure or experience with the “Muzungu”, or white person, as their cousins the Maasai. Pastoralists living in isolation and such hot arid conditions, their lives focus around their flocks which are entrusted to the Moran caste. When the Morans reach about 30 years of age they can marry and a new generation of young men carries on with care and protection of the livestock. Elder men are the decision makers and are looked up to. Women do all the domestic work and care for the families. Work that takes up most of their day. Our work with the women entails going through tiny remote villages which are basically clusters of oval, round topped homes made of branch, vine, thatch and leather. These “Manyatas” are residence to one or two extended families via dirt roads. Some may see a car once a month and most travel is by foot in the hot sun. Water is fetched from often remote areas though people like Andre are dedicated to creating easy access to clean water for the Samburu and their herds. Likely the most important and unexpected result of this “tour”, was the wealth of information that was shared with us by the Samburu on the medicinal and cultural functions of many of the local trees, plants and animals. The Samburu have a well-developed medicinal, spiritual/mystical and astrological tradition. They have a strong connection to the planet Venus and their creation myth tells of their origin on Venus before migrating to earth. This is reflected in the Ankh/Venus type adornment worn on the forehead of many Samburu women. The mystery of the bi-coloured Boswellia resin, Commiphora “Aqua Velva” and a Frankincense tree that squirts essential oil. “Confounded and perplexed I was”, to hear that over the past decades botanists had aggregated 6 different types of Kenyan Boswellia under the name Boswellia Neglecta S. Moore. 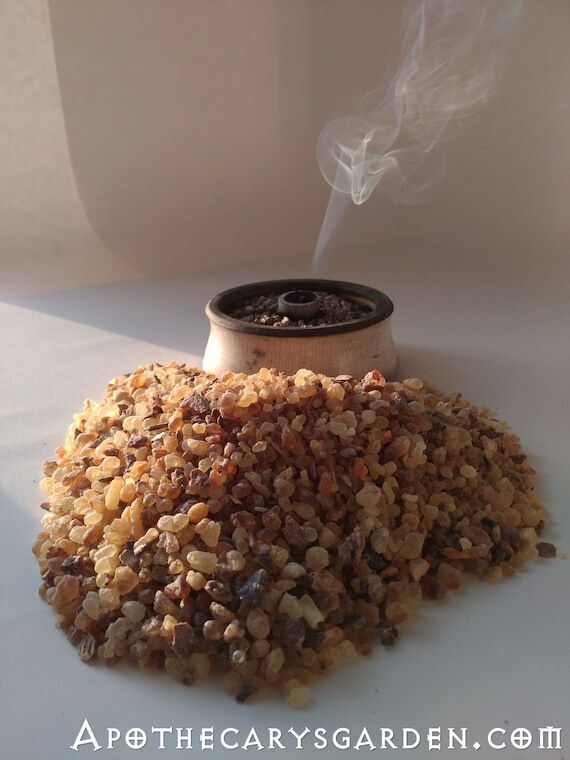 Currently it is considered by many to be the only Frankincense in the area. This in itself was enough to make me question the larger picture and accuracy of accepted distribution of Frankincense types in Kenya. So far, I belive we have come across 5 unique species of Boswellia in only 4 days. If this discrepancy was not enough, imagine my raised eyebrow when I was repeatedly told the Samburu women collected 2 types of “incense”, a black and a white from the same tree! Yes, 2 resin types from one tree. I had to get to the bottom of this. Frankincense-Boswellia Neglecta as know today. 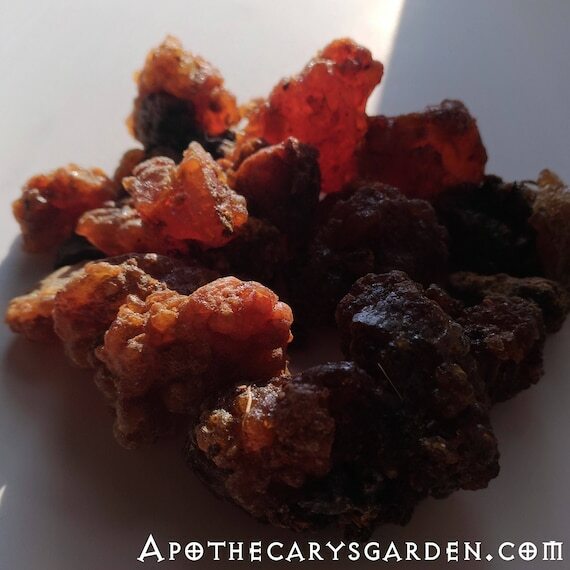 If you haven’t had the pleasure of meeting B. Neglecta personally, it is known and accepted as a blackish, grainy, fragrant oleoresin that appears in a lumpy form similar to our northern spruce and pine saps, and not in the clear/opaque aggregate of tear shapes associated with other Frankincense types. So how can both clear light tears, and most definitely solid black tar like resin be collected from one tree I ask? We spent 4 days in the semi-arid broiling sun of Samburu county, speaking with harvester women from numerous villages and were taken to the hills where one woman gathers her Frankincense resin. 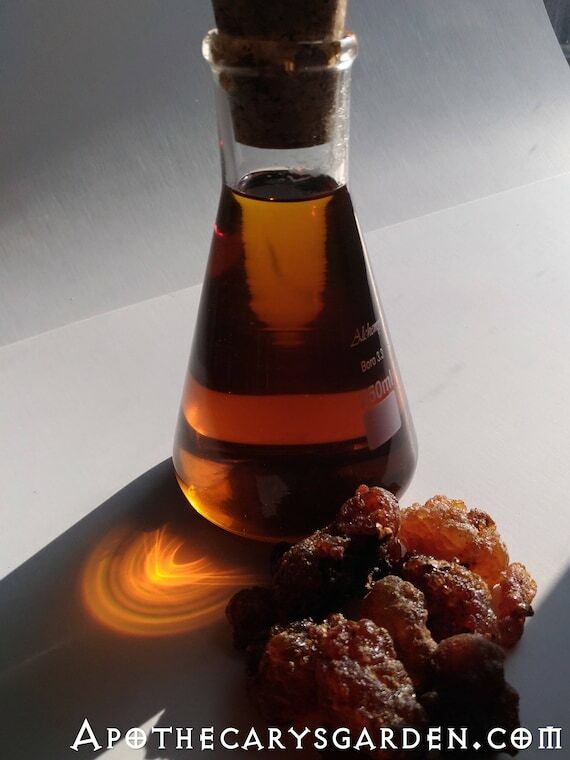 Imagine my surprise when I discovered for myself, with my own eyes, hands, nose, and mouth, that indeed, this particular Boswellia yields not one resin, but 2 distinct and disparate types of resin with completely different characteristics and fragrances! When injured, the tree’s first response is as expected. It produces globules of a clear slightly golden oleoresin, sticky and particularly fragrant which harden into translucent tears. However, what happens next is completely unexpected in a Boswellia tree. The tree creates traumatic resin ducts, (TRDs), and changes the chemical composition of the oleo resin to a “Callus” resin product much like our conifers. A grainy therapeutic living bandage that not only protects the exposed surface of a wound, but facilitates the growth of special tissue and bark from the edges of the wound towards the middle. If a branch is stripped, it forms a barrier between the stripped portion and the healthy part of the branch protecting it from the spread of decay. In our Spruce and Pine families this unique resin product is often of a brown colour. In the case of B. Neglecta this callus resin is black as pitch and of a rich deep woody frankincense fragrance. The callus resin of the Spruce tree is a potent medicinal used to heal old wounds, ulcers on the extremities and slow-healing surgical wounds in Scandinavian traditions. One can only wonder what medicinal properties lay undiscovered in the callus resin of B. Neglecta. This post is likely long enough for most people’s attention span, so I will till next time to tell you about the fragrant and brilliantly blue/aquamarine coloured Commiphora/Myrrh tree which I have dubbed “Commiphora Aqua Velva”. Its bracing fragrance does indeed remind one of the aftershave, but of course, it is much nicer :-). At that time I will share another cool find. A unique and as yet unidentified Frankincense tree that squirts pure essential oil when pricked and is used by the Samburu as a fragrance and sexual attractant. Many thanks to the talented Minna Kalliokoski for her photography and all her help on this trip. I am looking forward all the new resins and products that will be available from these ressources in the future – and your posts couldn’t be more interesting – THANK YOU! Can’t wait to see your new post!!! The experience you shared is AMAZING! The fact that B. Neglecta can produce both light and dark resins really excites me. Ancient Chinese incense books used to mention a kind of resin called Du Ru, which has both white and black varieties coming a same tree. However, it is hard for us, Chinese incense learners to determine what the resin is (because no pictures or objects exist). And your information offer us a possibility! I wish I can go on a trip one day just as you do! Looking forward to hear more from you. Thank you Shiyong Lu! I look forward to hearing more about your work with ancient Chinese incense! Hopefully smelling some of it as well. Thank you Laura. Support like your’s is invaluable and greatly appreciated. I love your posts! Don’t think you lose our attention span….your observations catch my attention! The superb photograph of Ystalia and her husband has been echoing in my thoughts since I first saw it yesterday. Please express my appreciation to Minna. It is striking isn’t it! I passed your appreciation to Minna. Made her smile. I could have read 10 more pages on this subject, Dan! Thanks so much for sharing 🙂 I’m looking forward to the next installment of your trip. Thank you Amanda!! A pleasure knowing you are on the other end of these posts..
I’m very much enjoying these articles! Thank you for this sensitive and magickal communication. Do you know the species (Latin name) of the acacia(s) that are growing with the myrrh and frankincense trees? This is indeed a powerful combination.